It is critical that these architecture areas be initially defined in this order. It is the process architecture that determines the types of policy and training structures and information needed, gathered, used, and reported. It is the information architecture combined with process architecture that defines the organizations requirements for the technology architecture. Too many organizations put the cart before the horse and start with selecting technology for policy and training management first, which then dictates what their process and information architecture will be. This forces the organization to conform to a technology for policy and training management instead of finding the technology that best fits their process and information needs. Corporate environment. Policies change in response to new strategies, objectives, mergers, and acquisitions. Changes in corporate commitments, contracts, values, ethics, risk appetite, and social responsibility statements also drive policy. Risk environment. Ongoing risk intelligence processes are required to monitor geopolitical, environmental, economic, strategic, relationship, and operational risk. Regulatory environment. New laws, changing regulations, litigation, and court rulings (case law) impact organizations and drive policy changes. Organizations need regulatory change management processes in place to monitor the changing legal and regulatory environment in jurisdictions where business is conducted. Policy ownership. Every policy in the organization should be assigned to an individual or business role that owns the policy. The owner ensures that the policy remains accurate, is appropriately communicated, and continues to serve the purpose for which it was established. Even if the policy is applied across the entire organization, such as with a code of conduct, the owner must oversee its implementation and monitoring. Policy writing. Once an owner is established, the next step is to write the policy. All policies across the organization should be written in a consistent style, format, and language while following a defined style guide. Policies must be clear and easily understood. They must articulate who the policy applies to, standards, rules, regulations or laws it intends to address, and what, if any, larger program it is associated with. Policy review and approval. Once the initial draft of the policy is written, the owner sends the draft policy to identified stakeholders for review and approval before publication. This phase is iterative, as the stakeholders may send the policy back with changes before it is approved. Leading practice includes reviews by the organization’s policy management office, legal department, and ethics and compliance committee (for policies mandated by law or regulation). Policy publication. After approval, the policy must be published. This is most effectively done with a centralized policy management and communication platform. Unfortunately, many organizations have scattered systems for publishing policies and procedures. This complicates policy management, as multiple publication methods means more policies will become outdated and scattered across the organization. A best practice is to have a single policy system that allows any individual within the environment to login, see all of the policies that apply to a specific role in the organization, and receive automated notification of a changed or new policy. Policy communication and training. Written policy is necessary, but not good enough on its own. Organizations must actively ensure individuals are aware of and understand the policy and what is required of them — appropriate communication and training should be used to facilitate understanding, such as video, LMS courses, surveys, and testing. It is important that training and other resources are linked to policies and are easily accessible. It is also important to preserve records of each individual’s training completion for critical policies so that they are easily accessible by oversight personnel. Policy attestation. It is necessary for individuals to attest to that they have read, understood, and will adhere to critical policies. Policies such as a code of conduct require specific attestation on a regular basis (e.g., annually). Attestations should be dated and time stamped, preserved with the version of the policy, and easily accessible by oversight personnel. Implement procedures and controls. The MetaPolicy states who is responsible for implementing the appropriate procedures and controls to ensure effective implementation, usually the Policy Owner. The procedures and controls should be written using approved templates and embedded within the business operations and processes. Monitor, test, and assess. Carefully monitor, test, and assess activities to ensure that the policy, procedures, and controls are being enforced, are operating as intended, and the business runs efficiently and smoothly while in compliance. Findings of noncompliance and violations provide metrics for policy review and improvement. Enforcement policy is critical, to define levels of infractions and associated actions. Manage exception requests. While policies must be complied with, there are justifiable business situations in which the organization accepts noncompliance. These exceptions must be documented and managed. An exception may be appropriate for a given time period or until a certain event occurs. Review, update, or retirement. 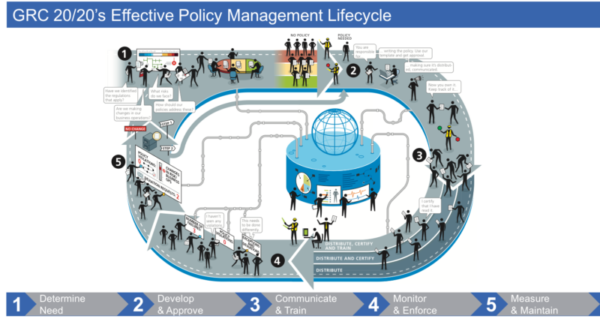 Every policy should have a regular review cycle (ideally annually). During this review, the Policy Owner and stakeholders assess changes to the internal business and external regulatory and business environments, look at incidents of policy noncompliance and approved exceptions, and consider the continued need for the policy. After this analysis the Policy Owner requests the policy approver(s) to reauthorize the policy as-is for another management cycle, to retire it, or to send it back into the Development and Update stage to revise the policy. Policy archives. Every policy and its associated versions must be archived for reference at a later time. The retention period for superseded versions and retired policies should be managed in accordance with the organization’s document and records-retention policies. When an organization becomes aware of an incident, or a regulator has a question, it is necessary to have a full view of the accountability history of a policy: the owner, who read it, who was trained, and who attested and on what version of the policy at a particular date. This level of detail is necessary to defend the organization in a situation involving a rogue employee, where the organization itself is not culpable. Previous post: Uncontrolled Spreadsheets, Documents, and Emails, Oh My!